Archive and History Committee chair Sharon Smith Holley. Moviolas and splicers, rewinders and synchronizers, photographs and books, the memories of post-production personnel… The history of the craft of editing and the union is there for everyone to see in the Editors Guild Archive, recently installed on the ground floor of the Guild’s Los Angeles headquarters. 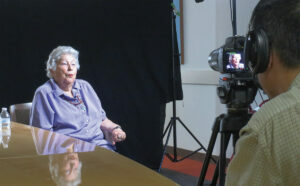 Picture editor Anne V. Coates being interviewed in 2014 for the Guild Archive’s Legacy Collection of visual oral histories. Following the General Membership Meeting held in the Dede Allen Seminar Room last October, the 100-plus members who attended were invited across the lobby to the first official open house for the archive, a large-scale, decade-long effort to collect and exhibit the materials and stories of post-production crafts. Holley was gratified by the reactions to the archive from those attending the meeting. “When members who have had personal experience with the equipment share their stories, the room really comes alive,” she explains. Over the past 10 years, Holley, with the committee and its volunteers, has collected a great wealth of materials that is stored in the Guild’s basement and offsite. 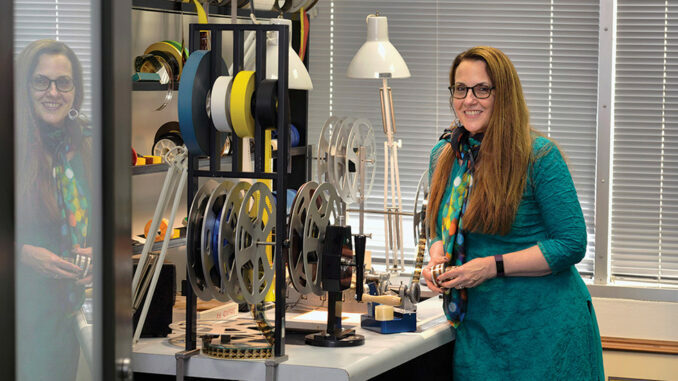 She plans to rotate exhibits each year to provide hands-on insight into the evolution of film editing — the only moviemaking craft originating directly from the film medium itself. Along with exhibition space, the remodeling of the old offices included designing a studio for shooting extensive interviews of Guild members of all classifications to document a personal history of the industry through their working experiences. Another room houses an Avid to edit these visual oral histories for a major component of the archive: the Legacy Collection. When CineMontage visited the Guild Archive to speak with Holley, retired sound editor and volunteer Lou Kleinman was on the Avid editing a recent interview, smoothing it out without cutting any of the interviewee’s stories. For a year and a half, he has volunteered to edit the interviews and has been interviewed for the Legacy Collection himself — “It’s my Academy Award,” he smiles. 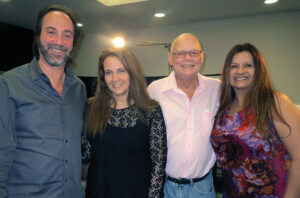 Guild archivist Sharon Smith Holley, second from right, with picture editor Stephen Rivkin, left, picture editor Randy Roberts and his partner Heidi Scharfe. in 2014, Rivkin interviewed Roberts, who passed away less than a year later, for a visual oral history. Between classes and during summers, Dousarkissian has edited Legacy interviews and, three years ago, organized all the interviews completed so far onto fewer hard drives and set up a database for easy access. Last year, she got a fuller idea of the work the interviews required when she scheduled six shoots on her own. A visual effects editor and assistant editor, Holley has been a Guild member since 1990 and a Board member since 1997. “I wanted to be on the Board because I wanted to do educational things for our members,” Holley says. Soon after joining the Board, she developed two educational programs specifically for assistant editors: 36 “Assistant-to-Assistant” seminars and 35 informal “Fireside Chats.” For the chats, editors screened clips from their films to discuss their working methods and their relationships with directors and producers. These gatherings gave Holley more contact with members who would later be interviewed for the Legacy Collection and helped her work out the best questioning approaches for the interviews. 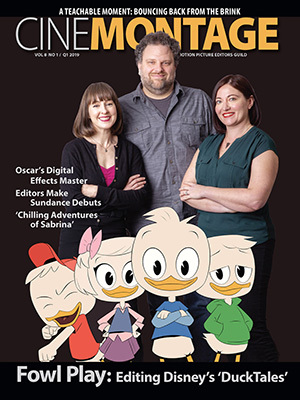 Furthering her interest in members’ personal stories, in 2005 Holley produced a four-week series of panels about the art of editing called “Cut to the Chase” with Academy of Motion Picture Arts and Sciences director of Educational Programs and Special Projects Randy Haberkamp. 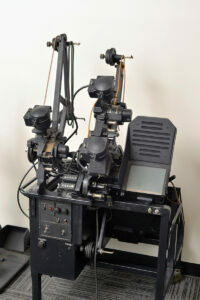 A black upright Moviola, which began being used in the 1920s. This piece was donated by the American Cinema Editors when the organization recently moved offices. For each week of the series, she wanted to display a different lobby exhibit of equipment and photos depicting the craft of editing from vintage to digital. She discovered, however, that the Academy’s Margaret Herrick Library did not yet have a sufficient number of photographs showing post-production professionals working behind the scenes. Recognizing the need for archival resources, Holley approached the Guild’s Board early in 2007 to create a post-production history project — encompassing a physical archive of the tools of the craft, a photo archive for images of members at work, and the Legacy Collection for visual oral histories of members telling the stories of their careers. The night she introduced this proposal, the Board voted to establish the Archive and History Committee and Holley was appointed as chair. In August 2007, with an eye to recording the oldest retired members to capture their memories of earlier industry history, she videotaped the first Legacy oral history — with then-97-year-old Guild charter member Mary Steward, a longtime assistant editor at 20th Century-Fox with experience working on major films directed by John Ford and Henry King. Steward was interviewed by Board and committee member and assistant editor Jeff Burman. Including the earliest interviews, Holley has now produced about 170 oral histories, serving as interviewer for some of them (including one of her mentors, former Guild President Donn Cambern, ACE). 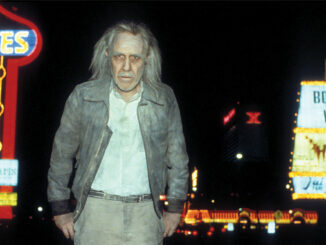 During the first three years, 45 interviews were shot on mini-DV; afterwards they were all shot digitally. The first 45 interviews were transferred to hard drives and the original tapes moved to the Academy vaults in 2014. At least two cameras have been recording every shoot. Varying in length, the interviews average about 90 minutes each. “The goal has always been to hear the members’ stories with the interviewer off-camera, except when someone close to the subject was the interviewer,” Holley notes. Examples of these close relationships include sound editor Sam Crutcher interviewing his father, sound editor Norval Crutcher, as well as sound editor James Nelson (both of whom have passed), and picture editor Virginia Katz, ACE, interviewing her father, Sidney Katz, ACE, before he died. The setup changed to interviewers off-camera in 2014, when director Edgar Pablos came in with cinematographer Kak Lee to record about 70 interviews, and Lee has continued to shoot for the Legacy Collection since. 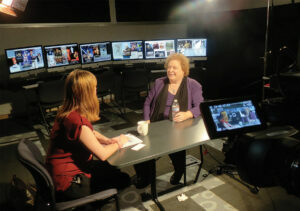 Retired sound editor Victoria Sampson, right, is interviewed by her daughter, Amy Rose Sampson for a visual oral history in 2014. 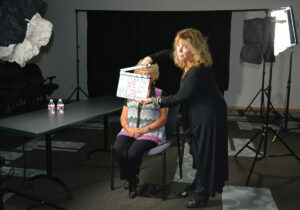 Former negative cutter, assistant editor and Board member Christi Moore, right, serves as a production assistant of the Legacy Collection shoot of retired lab film technician Sally Aquila in 2015. Throughout 10 years of interviewing, Holley has managed to recruit volunteers from friends and family, including her niece, Madison Harding, who put in a few months-long stints at organizing and scheduling. Others, like Dousarkissian, Kleinman and picture editor Randy Vandegrift, see the value of the work and learn from it also. For a few years, Guild member John Acosta, who left the industry to teach editing at Kingsborough Community College in New York, had his students cut some interviews as class projects. Working on interview transcripts and as “hospitality” at shoots, former negative cutter, assistant editor and Board member Christi Moore says, “I felt lucky just to listen.” Currently, retired assistant editor and interviewee Irvin Paik keeps track of volunteer schedules and the status of interviews, as well as doing some sound and editing; “It’s really a lot of interesting history,” he adds. DuPell first became involved with the archive in 2012 while working with the Guild as an intern. A pictorial display was planned for the Editors Guild’s 75th Anniversary Gala and she helped to organize what had accumulated in the photo archive since 2007, when the call went out to members to submit pictures. Holley also started organizing the physical archive, the third component of the Guild Archive. With the industry’s dramatic shift in technologies, she feels it essential that Guild members have a means to understand the difference between handling film physically and manipulating it electronically. 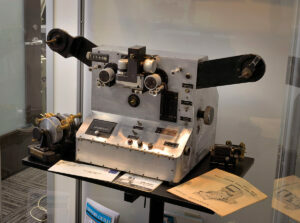 A Click Marker machine, circa 1951, from 20th Century-Fox. It made click noises in the soundtrack when run through sound heads to keep beats and rhythms for the composer during the scoring session. 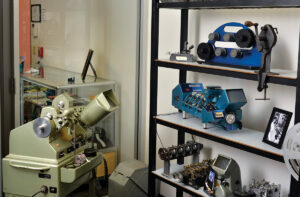 In 2014, Heim himself donated some classic film editing equipment he had collected over the years, including a Westrex 70mm hot splicer and a 1910-vintage Edison splicer — “the first piece of old equipment I ever bought,” he points out. “All of these things are treasures; they are undervalued and becoming rare.” The Archive also has a wall of vintage film books, mostly contributed by Heim and Jack Tucker, ACE. For the opening of the archive space, Joel Marshall of the Atomic Film Company editing supply house loaned the Guild an editing film bench with early 1930s rewinds that Anne V. Coates, ACE, was seen using in her cameo as an editor in Martin Scorsese’s The Aviator (2004), set in that decade. Also, Rhythm and Hues visual effects editor/editorial manager Josh Margolies donated a KEM table and the film benches that Holley had used while working there. Coming soon to the physical archive are donations from Universal Studios of film trim boxes, cores and film leader. While the Guild Archive grew, Holley’s work with the Academy on “Cut to the Chase” led to a larger collaborative undertaking involving the Legacy Collection. Haberkamp also oversees AMPAS’ long-running Oral History Projects, and the Academy has begun to work with other industry organizations to do oral histories representing its 17 different craft branches. Late in 2012, the Academy hired Teague Schneiter (who had been visual history archivist for the Directors Guild of America) as senior manager of Oral History Projects to manage all of the Academy’s oral history activities and to bring more structure and consistency to the proposed collaboration among film organizations. Initiating the Academy Visual History Program, Schneiter and Haberkamp began leading an effort to determine the preservation and access needs for a larger collection of filmmaker interviews. 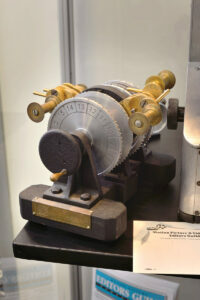 A vintage synchronizer from Twentieth Century Pictures, a studio that was only in existence from 1933 to 1935, when it merged with the Fox Film Corp. This piece is on loan from Joel Marshall of the Atomic Film Company editing supply house. Schneiter was elected chair, with Holley one of three co-vice chairs with Jenni Matz of the Television Academy Foundation and Patrick Russ of the Film Music Foundation. 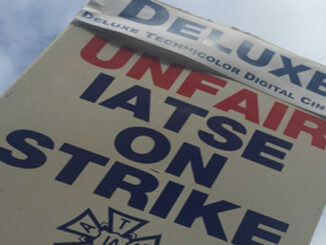 Rosemarie Knopka of the Art Directors Guild was elected Secretary. Eight industry organizations are now members. In October 2016, the alliance officers attended the annual national meeting of the Oral History Association to present their plan for developing standards and practices for a digital workflow for the preservation of visual oral history documents — standards and practices applicable to oral history documentation in a wide range of businesses and professions. As technology continues changing, Holley feels that the Academy is best equipped to transfer the Guild’s Legacy Collection to the new media so that the interviews can be safely and easily accessible. She looks forward to making the Guild Archive interactive and for members to have access to the interviews. “It’s for our future members,” she asserts. Holley thinks her interest in the discipline was triggered as a teenager, when she was appointed grand historian of the Florida chapter of the International Order of the Rainbow for Girls, a Masonic youth service organization. Now, dedicated for 10 years to the Archive — devoting 20 hours a week to it (up to 40 hours a week when shooting interviews) while maintaining a successful freelance feature career — she is pleased with the encouragement of professional archivists like Schneiter, Lammers and Takahashi. “There is something really rewarding about envisioning something for almost a decade and seeing people appreciate it,” she says. Repola expresses the Guild’s appreciation clearly: “On behalf of the membership and all future generations, a special thanks to Sharon and her committee for making this project a reality.” As does Heim; “The Guild Archive is due to Sharon’s blessed perseverance,” he maintains. Current members of the Archive and History Committee are Burman, Alyson Moore, Glenn Morgan, MPSE, and Stephen Rivkin, ACE. For more information on the Guild Archive, e-mail MPEGArchives_ssh@aol.com.